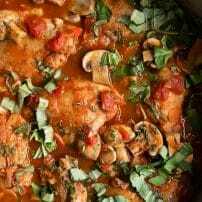 Also known as hunter’s chicken, this Chicken Cacciatore Recipe is a comforting and irresistible one-pot classic chicken dish filled with mouthwatering, juicy, fall off the bone chicken, mushrooms, garlic, peppers, bathed in an aromatic red wine tomato sauce. Translated, cacciatore in Italian means “hunter”. As such, a meal prepared alla cacciatore (such as this Chicken Cacciatore Recipe) is typically a dish that has been prepared “hunter-style” with herbs, onions, tomatoes, bell peppers, and sometimes, wine. There are several variations of cacciatore, each determined by which ingredients are available in specific regions. For example, visit southern Italy and you’ll find a cacciatore including red wine. On the other hand, in northern Italy, you may find this dish prepared with white wine. Certain variations may or may not include mushrooms, tomatoes, or bell pepper. 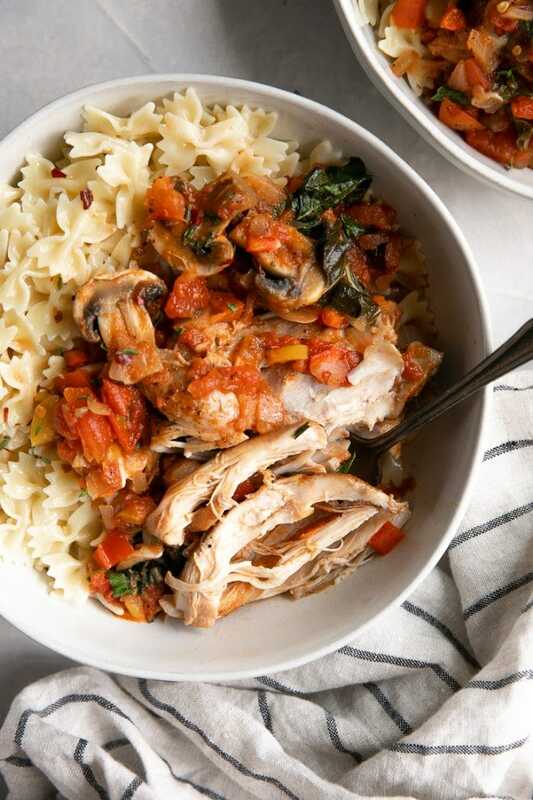 This easy and classic Italian Chicken Cacciatore Recipe, which includes all of the above (minus the white wine), will quickly become one of your favorite family meals. Perfect for feeding a large crowd, or meal prepping to enjoy all week long, it’s impossible not to love everything about this one-pot meal. The overall preparation and execution of this classic Italian comfort food is likely much easier than the name sounds. With that said, Chicken Cacciatore is not a recipe that should be rushed to the finish line. Trust me, the reward is well worth the wait. To begin, you’ll want to add the olive oil and butter over medium-high heat to a large Dutch oven or high-sided skillet. 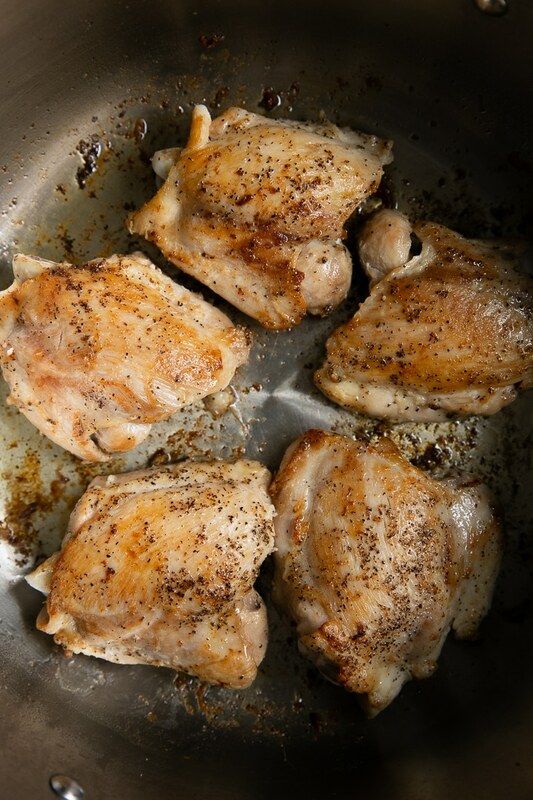 Add the chicken thighs, seasoned with salt and pepper, to the skillet and sear for three to four minutes on each side. Since this recipe calls for eight chicken thighs you will probably have to do this in two batches. Remove the chicken to a clean plate to rest. If you decided to keep the skin on your chicken thighs, I highly recommend draining off at least half of the fat from the pan. Of course, this is optional, but it creates a much heavier feeling dish. If you removed the skin (as I did below), then this step is not necessary. Reduce heat to medium and add the onions. Sauté until soft and translucent and then stir in the garlic. Yes, the whole 10 cloves of garlic. Stir constantly for approximately 1 minute, or until the garlic becomes nice and fragrant. Add the bell peppers and carrots. Cook on medium-low for 5-10 minutes before seasoning with a generous pinch of salt and dried oregano. Add the wine and simmer until reduced by half, then add the remaining herbs (thyme, parsley, basil). 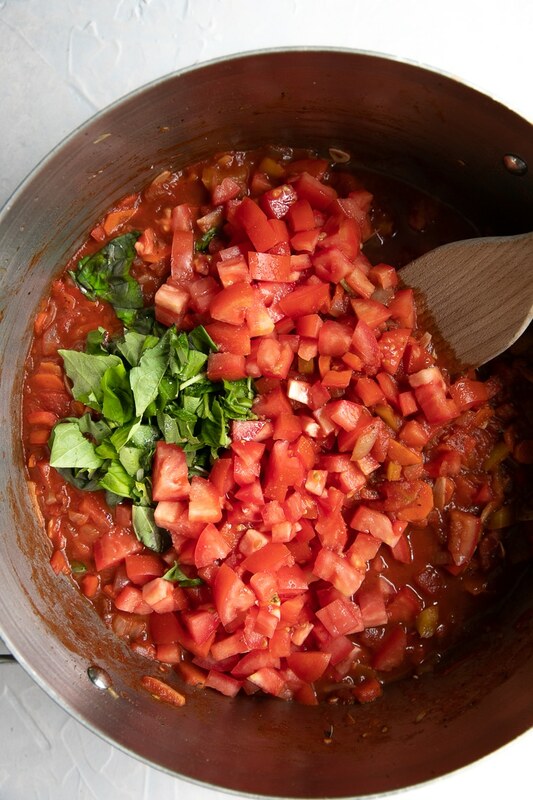 Mix in the tomato paste with the chopped vegetables and herbs before finally adding the crushed tomatoes, Roma tomatoes, and low-sodium chicken broth to the pan. Add additional chopped basil, if desired, and bring to a low boil. Reduce heat to a simmer and carefully tuck the seared chicken thighs among the sauce. Cover and cook for at least 45 minutes to 2 hours. Approximately 10 minutes before serving, add the sliced mushrooms to the pot. 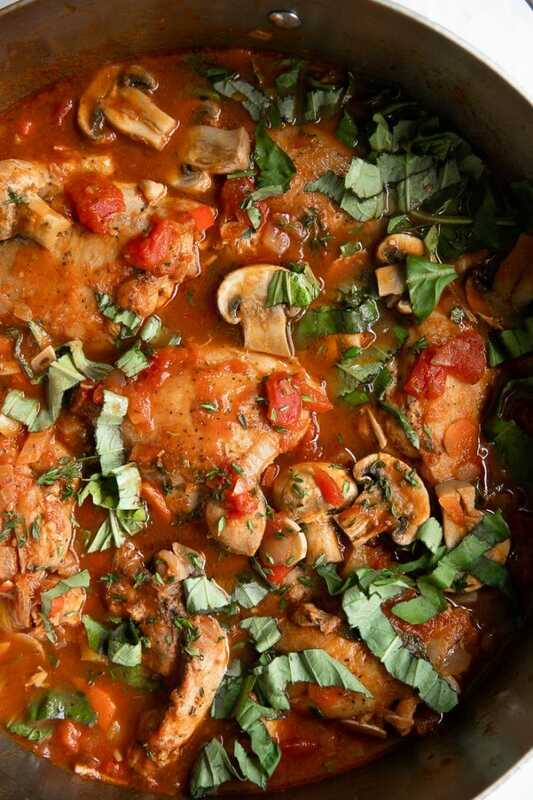 What chicken pieces should be used in Chicken Cacciatore? The real answer to this question is that anything will work. 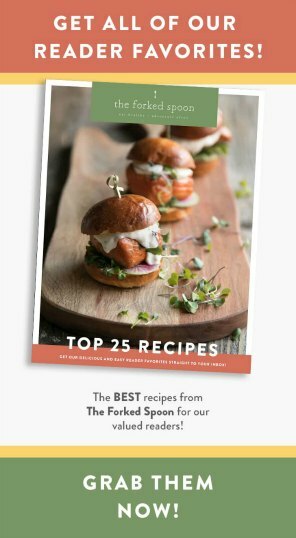 Five years ago I most definitely would have chosen chicken breasts since, as we all know, they are the leanest type of chicken you can purchase. 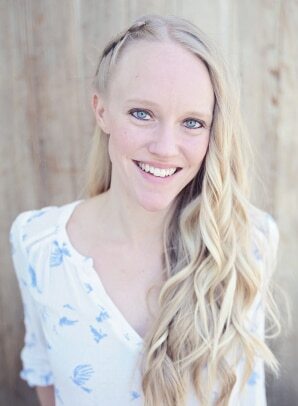 However, I’ve cooked a lot in those five years and feel like I have aged considerably. I’m no longer in my twenties and my cooking, more and more, is starting to resemble my mothers. In other words, I now cook with chicken thighs. Or, at the very least, I cook with chicken thighs whenever I make this recipe. But not just any chicken thigh will do. You want skinless, bone-in chicken thighs. 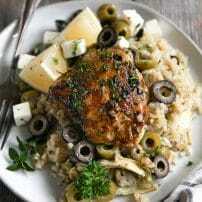 Chicken thighs, slightly higher in fat, are naturally juicier. You guys, we want this. 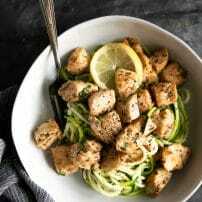 Chicken breasts, on the other hand, will not fall off a bone (obviously because they’re not exactly on a bone) and will most definitely dry out (especially if you plan to eat this for leftovers one night). So why did I remove the skin? Chicken skin is amazing when it’s perfectly charred and crispy. In stand-alone dishes where you can really appreciate the chicken, I will leave the skin on. But in this Chicken Cacciatore, the skin would get lost in the mix of things and turn a healthy meal into a much heavier one. It’s simply not necessary. Of course, you don’t have to listen to me. Feel free to use drumsticks, chicken breasts, skin-on thighs, or whatever you’ve got. 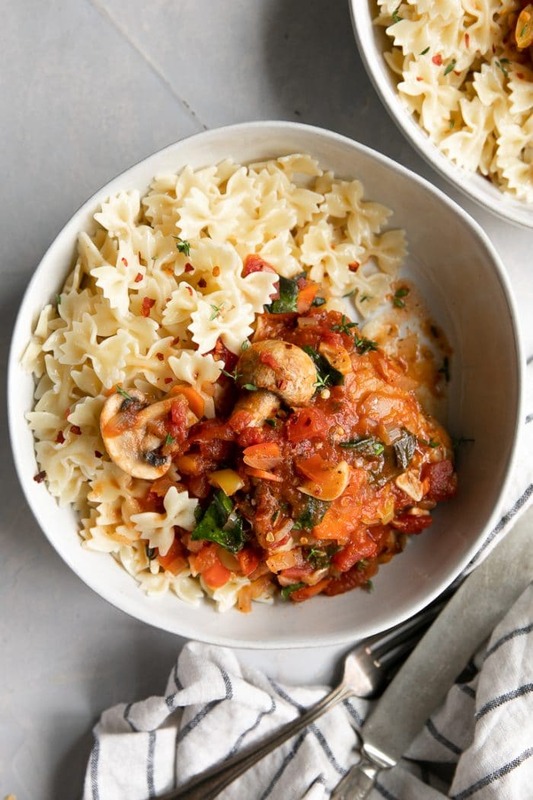 To make this chicken cacciatore recipe dairy-free, simply omit the butter and replace with non-dairy butter substitute or additional olive oil as needed. Tomatoes. I often like to use a mixture of canned and raw tomatoes in different recipes. To be entirely honest, I don’t have a real reason for this other than personal habit, so feel free to substitute the raw Roma tomatoes with one (28 ounce) can of diced tomatoes. The wine is optional (but recommended). Feel free to leave out the wine and substitute with additional chicken broth. 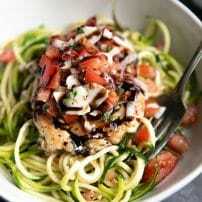 You may also want to consider adding 1-2 tablespoons of balsamic vinegar with the tomatoes. Don’t feel pressured to add specific vegetables. And by that I mean…mushrooms. Not everyone loves mushrooms. If you’re one of those people, simply leave them out. 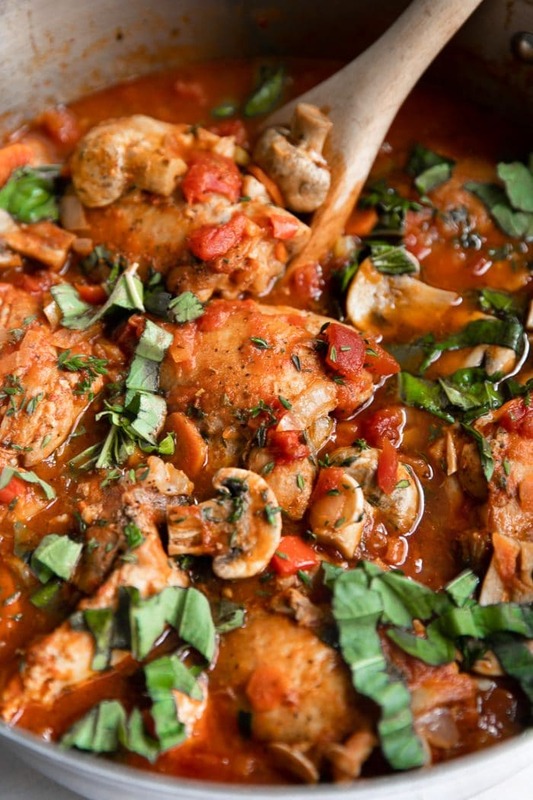 Fortunately, it’s not a deal breaker for a delicious Chicken Cacciatore Recipe. Fresh garlic and lots of it. Ok, guys, I know that peeling and mincing fresh garlic is incredibly time-consuming, but it’s one-hundred percent worth it. Fortunately, in a recipe such as this one, you can be lazy and “roughly chop” or even slice your garlic. This hunters chicken is easily adaptable and loves to pair up with all kinds of different side dishes. Traditionally, however, one would find Chicken Cacciatore served with some kind of plain pasta or a chunk of rustic bread. Nothing fancy, just simple, plain, maybe buttered. 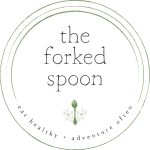 If you’re looking for a more complete meal, I recommend something like roasted or mashed potatoes, Brussels sprout salad, rice, or even cauliflower rice for a more low-carb option. Chicken Cacciatore makes some of the very best leftovers, so I highly recommend making extra to enjoy all week long for easy lunches and dinners. The easiest way to store this chicken dish is to keep the chicken and tomato sauce separate from any side you chose to serve it with. For example, I served this with simple, buttered mini-bowtie noodles. Rather than mixing everything together once the chicken was cooked, I left them separated. Of course, if you’re serving this to a large group or family, then you may find it easier to present it in a large serving bowl, but for my small family of three, I knew we would be eating this for at least two to three nights. Allow the chicken to cool slightly before transferring to the refrigerator for up to 3-4 days. 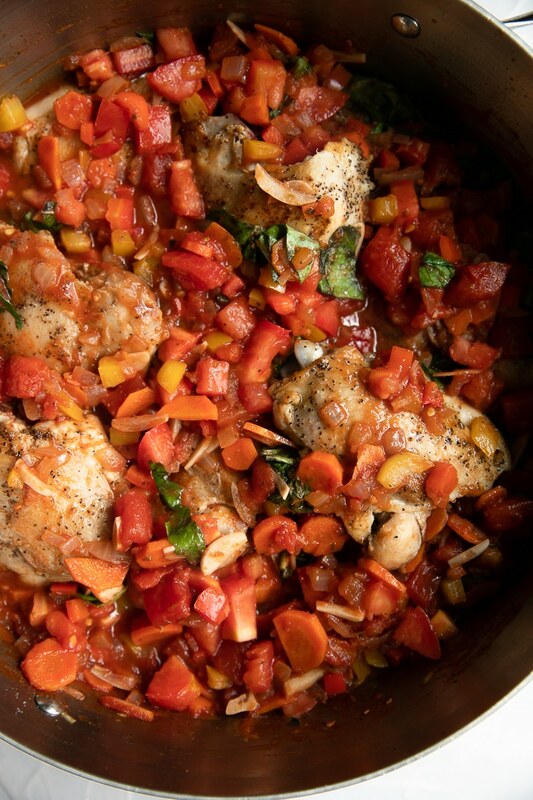 If you try making this Chicken Cacciatore Recipe, please leave me a comment and let me know! I always love to hear your thoughts. 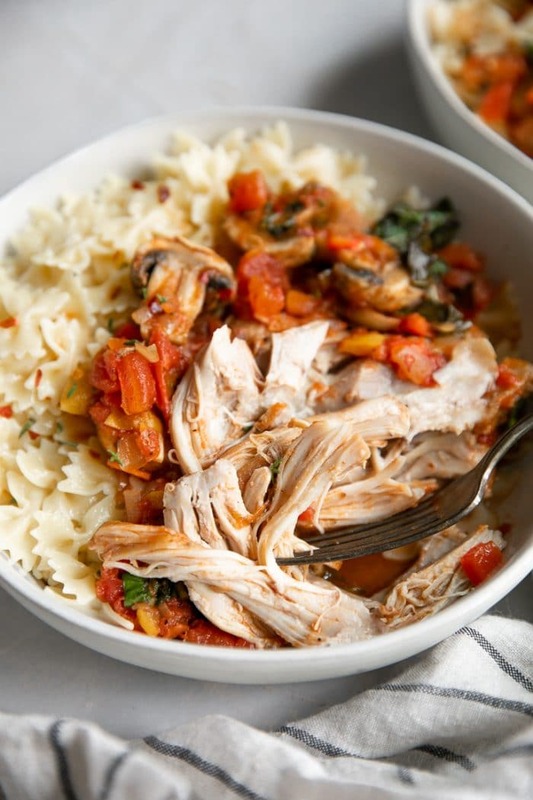 DON’T FORGET TO PIN AND SHARE THIS EASY AND DELICIOUS CHICKEN CACCIATORE RECIPE AND ADD IT TO YOUR NEXT WEEKLY MEAL PLAN! Chicken Cacciatore is filled with mouthwatering, juicy, fall off the bone chicken, mushrooms, garlic, peppers, bathed in an aromatic red wine tomato sauce. Season each side of the chicken thighs with salt and pepper. Add olive oil and butter to a large Dutch oven over medium-high heat. Add the chicken thighs and sear each side until golden brown- approximately 3-4 minutes on each side. Remove the chicken pieces to a clean plate and set aside. Reduce heat to medium and add the onions to the pot. Sauté for 3-4 minutes, or until starting to soften and turn translucent. Add the garlic and continue to cook until fragrant, approximately 1 minute. 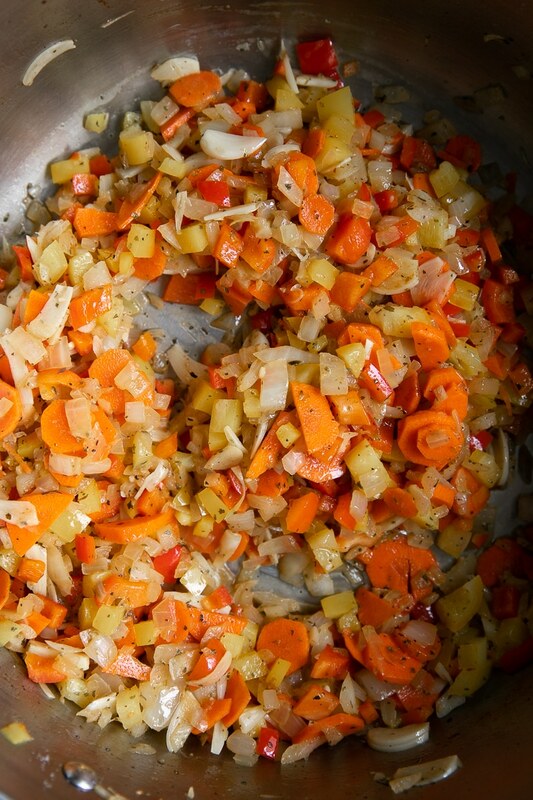 Add the bell peppers and carrots and sauté for approximately 5 minutes, or until vegetables being to soften. Stir frequently. Season the vegetables with the dried oregano and a generous pinch of salt. Pour in the wine and allow to simmer and reduce by approximately half. Add the fresh thyme, chopped parsley, half of the fresh basil, and tomato paste. Mix well to combine. Stir in the crushed tomatoes, chopped Roma tomatoes, and low-sodium chicken broth. Tuck the browned chicken thighs in among the sauce and bring to a simmer. Cover and reduce heat too low. Cook for 45 minutes to 2 hours, or until chicken is falling off the bone. Add the sliced mushrooms and cook for an additional 5 minutes. Remove pot from heat. Garnish with additional fresh basil, parsley, or thyme. Serve with your favorite pasta noodles, mashed potatoes, or fresh buttered bread. Enjoy! For a dairy-free option- omit the butter and replace with non-dairy butter substitute or additional olive oil as needed. Feel free to substitute the raw Roma tomatoes with one (28 ounce) can of diced tomatoes. Keep leftovers stored in the refrigerator for up to 3-4 days.